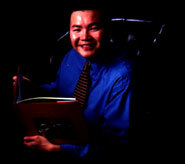 Vuthy Kuon, pronounced "wood-TEE kwan," has been featured on NBC, ABC, CBS, and FOX television promoting his work as an author, illustrator, and public speaker. He has spoken at hundreds of schools and conferences, entertaining hundreds and thousands of children and adults across the nation. Inspired at the Rhode Island School of Design by his professors David Macaulay, Barry, Moser, and Mary Jane Begin, Kuon is now most recognized for his art and writing in children's books. However, his talents have also been showcased as a cartoonist, designer, and photographer. He currently resides in Houston, Texas and enjoys spending most of his time creating and inspiring people with his stories and art.